An era ended for Zimbabwe on Nov. 21 when Robert Mugabe resigned as its president. Mr. Mugabe has ruled the country since independence in 1980, and in that time, Zimbabwe moved from relative prosperity to poverty, from multiparty democracy to one-party rule—and back—and from reconciliation to relative authoritarianism. Mr. Mugabe’s departure was the culmination of what most observers consider a peaceful military coup, though the Zimbabwe Defence Force vehemently denies it. The new president, Emmerson Mnangagwa, was sworn into office on Nov. 24. When is a coup not a coup? When it happens in Zimbabwe. Though the Zimbabwean Army seized de facto control of the southern African republic, it did not forcibly depose the 93-year-old head of state. With his sons living in South Africa and his wife, Grace (who was understood to be his preferred successor as president), in hiding, Mr. Mugabe was holed up in his residence throughout the process in the capital, Harare. Meanwhile, while the ruling ZANU-PF party (Zimbabwe African National Union—Patriotic Front, the successor party to ZANU) was in the process of formally firing him from the presidency, mediators including a Jesuit priest, Fidelis Mukonori, tried to get the president and the military to reach an understanding. The Zimbabwe Catholic Bishops Conference and the Zimbabwe Council of Churches issued statements urging calm, restraint and patience during what the bishops called “most delicate times.” In a context of deep economic crisis, with millions of Zimbabweans working outside the country and widespread poverty within, their concern was that the crisis should not propel the country into deeper chaos. Who is Mr. Mnangagwa? Born in 1942, President Mnangagwa fled to Zambia from what was then Southern Rhodesia as a child with his family because of his father’s anti-colonial activism. In 1963 he joined the Zimbabwean African National Union (ZANU), did political and military training in Tanzania and China, saw combat and was captured. He was imprisoned in Rhodesia for almost eight years. Deported to Zambia, he qualified as a lawyer and rose in the ZANU ranks. After Zimbabwe’s independence in 1980, he served in Parliament; held ministry roles, including at State Security (during the time of the infamous Gukurahundi massacres of alleged Ndebele dissidents in southern Zimbabwe), Finance, Rural Housing, Defence and Justice; and was speaker of the House of Assembly (2000-2005). His career has waxed and waned, as has his relationship with ex-President Mugabe, culminating in his tenure as First Vice President from December 2014 until his dismissal a few weeks ago. Mr. Mugabe’s decision to fire Mr. Mnangagwa as his vice president on Nov. 6 precipitated the “coup.” Mr. Mnangagwa had been opposed to Grace Mugabe’s bid for the presidency—an opposition shared by the majority of ZANU-PF members. Fleeing to Mozambique and then South Africa, Mr. Mnangagwa warned that Mr. Mugabe and his wife would “leave ZANU-PF by the will of the people…in the coming few weeks.” Police attempts to arrest General Constantino Chiwenga, close to Mr. Mnangagwa, on Nov. 12 failed, and within Zimbabwe, leaders of the armed forces threw their lot in behind Mr. Mnangagwa. By Nov. 14, military vehicles were seen moving in and around Harare. That evening the army took over the state broadcaster, Zimbabwe Broadcasting Corporation. Homes of key Mugabe supporters, including some cabinet ministers, were raided. Some were arrested, some went into hiding. Mr. Mugabe was himself not arrested. Over the next few days leaders in the Zimbabwean military, ZANU-PF leaders and the former prime minister and leader of the Movement for a Democratic Change—Tsvangirai (the main opposition party), Morgan Tsvangirai, called on Mr. Mugabe to resign. He refused. Despite the military presence in the capital and in Zimbabwe’s second city, Bulawayo, the situation was peaceful. Life went on as normal. On Nov. 18 a massive, peaceful crowd marched from downtown Harare to State House, Mr. Mugabe’s residence, to demand his resignation. Similar demonstrations occurred in other Zimbabwean cities, in South Africa and in Britain, where many expatriates live. The following day ZANU-PF fired Mr. Mugabe from his position, expelling him, Grace and about 20 close associates from the party and giving him 24 hours to vacate his position. That night, Mr. Mugabe spoke on Z.B.C. television, refusing to resign and insisting that he would preside at the upcoming ZANU-PF Conference ahead of the 2018 general elections. The ZANU-PF ultimatum expired on Nov. 20, amid legal discussions as to the constitutionality of Mr. Mugabe’s dismissal. The following day he resigned. These, then, are the bare bones of Zimbabwe’s “non-coup.” But what is behind it? The most immediate cause had been the dismissal of Mr. Mnangagwa, who had been part of an internal ZANU-PF leadership race to succeed Mr. Mugabe that was expected after his death. The party was split between Mr. Mnangagwa’s supporters and those of the president’s wife. The latter had built up a bloc known as Generation 40 (or G40), drawn mostly from the youth. It was widely believed that she had her husband’s full support in the bid to be his successor. The rest of ZANU-PF, particularly those coming from within the military, back Mr. Mnangagwa—or are at least sitting out the current dispute. Mr. Mnangagwa has clearly won the internal power struggle. But will his victory lead to greater democracy in Zimbabwe and an improvement in its severely struggling economy? Though some speculate that Mr. Mugabe’s departure may lead to a short-term improvement in the economy, the longer term may be less sanguine. Based on his parliamentary and cabinet career, Mr. Mnangagwa has a far from salubrious track record: there are allegations of past involvement in widespread human rights abuses and corrupt financial dealings. During his tenure as speaker, it was alleged that he was involved in illicit mineral trafficking in the Congo during that country’s civil war, in which Zimbabwean military were involved as peacekeepers but also, many believe, defenders of mining interests of questionable legality involving top ZANU-PF cadres. This led to Mr. Mnangagwa being investigated by the United Nations, who recommended the imposition of a travel ban on him, particularly for allegedly making Zimbabwe a center for illicit diamond trafficking. Whatever the truth of these claims, he is widely believed to be one of Zimbabwe’s richest citizens. 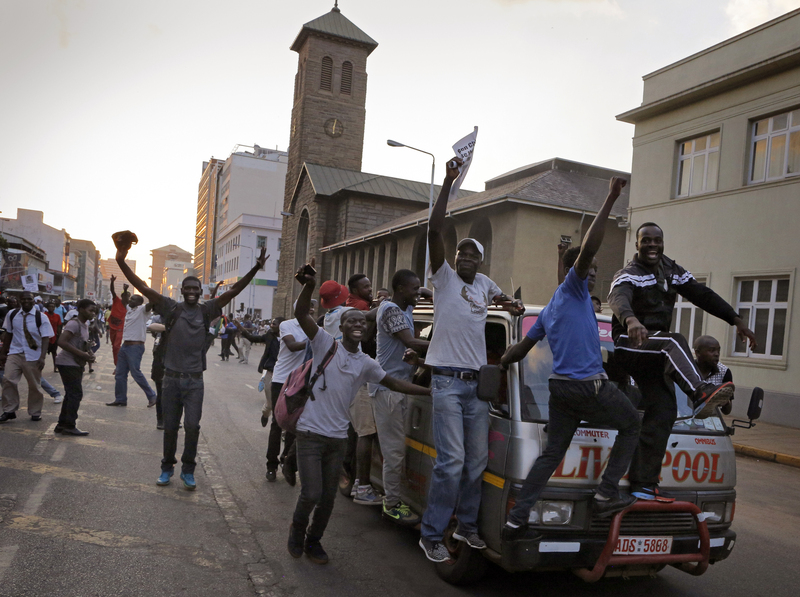 For now, the mood in Zimbabwe has moved from jubilant to guardedly optimistic. Some even call Mr. Mugabe’s resignation a “second independence.” While the future is by no means clear, the sense at the moment is one of hope. Despite Mr. Mnangagwa’s controversial past, first signs are positive. He has radically slashed the number of delegates to ZANU’s forthcoming party conference from 16,000 to 6,000 and reduced its budget dramatically. These actions, according to one of my Zimbabwean contacts, are meant to signal government austerity in a country where there is massive unemployment. Further reforms may be underway. Anthony Egan, S.J., is one of America's Johannesburg correspondents.